At the stroke of noon on Friday, March 15, fourth-year medical students at Emory University School of Medicine gathered for the Match Day 2019 ceremony. 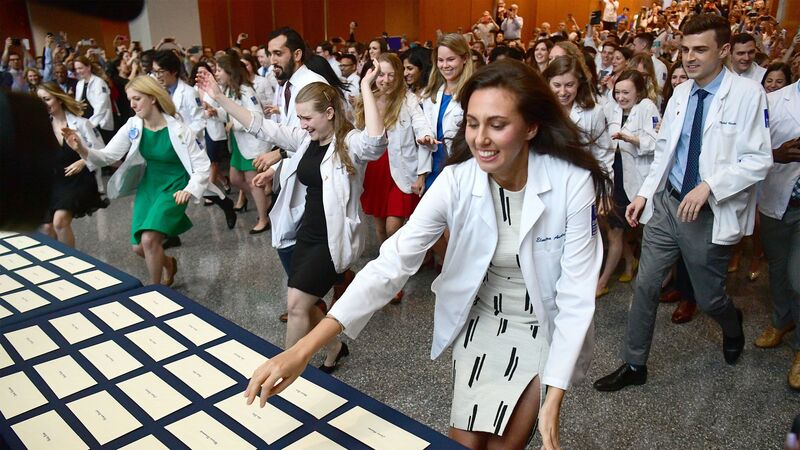 The next generation of America’s doctors dashed across the room, ripped open envelopes and excitedly discovered where they will continue their training as physicians. The Emory students were among thousands of graduating medical students receiving positions at U.S. teaching hospitals through the National Residency Match Program that annually matches students with residency programs. Residents are licensed physicians who care for patients under the supervision of attending physicians. “It’s been a privilege having these students as part of the Emory community,” says J. William Eley, MD, MPH, executive associate dean for medical education and student affairs for the Emory School of Medicine. Emory’s Class of 2019 included 116 students participating in the match program. Thirty-seven students will spend all or part of their residencies in the state of Georgia, and 30 of those students will begin their internship year at Emory. In addition to Emory, the students will receive their residency training at other prominent institutions including Brown, Duke, Harvard, Johns Hopkins, Yale, New York University, Northwestern, University of Pennsylvania, University of Washington and others. Some of the most popular specialties chosen by Emory&apos;s graduating seniors in the 2019 NRMP match include internal medicine (30), general surgery (18), obstetrics and gynecology (12), emergency medicine (11), pediatrics (8) and anesthesiology (6). Prior to Match Day, four Emory graduating seniors had matched into military residencies, four students had matched in urology, and four students had matched in ophthalmology. The Match was established in 1952, at the request of medical students, to provide a fair and impartial transition to the graduate medical education experience. A complex algorithm, administered by the NRMP, factors in the preferences of the students with the preferences of residency programs in order to match students and training programs. Match Day moments: Watch as Emory medical students find out where they matched to continue their training as physicians. Robert Alleyne grew up in Stafford, Virginia, and graduated from Brown University majoring in neuroscience. He grew up in northern Virginia in a military family just miles from Quantico. “Although childhood experience with family deaths initially ignited my curiosity in medicine, my commitment to health care matured as I established close ties with the Providence, Rhode Island, community during college by co-developing a student-run mobile clinic that performed health screenings for the unsheltered and uninsured patients in street corners, churches and soup kitchens,” Alleyne says. Specializing in emergency medicine, he is grateful for the patients who have allowed him the opportunity to be of service in medicine. His most lasting memory from medical school was his first patient of third-year clinical rotations. “He was a young, quick-witted veteran with a new family who was recently diagnosed with liver cancer and placed on palliative care," Alleyne recalls. "We developed a strong relationship after many hours of conversation about his life, his hope to see his baby daughter get married, and some competitive card games." Long after Alleyne&apos;s rotation ended, the patient continued to send updates on his improved health status and prognosis. One day, he called to share that he was going into the hospital and he was worried this time would be different. A few weeks later, Alleyne received a call from the patient’s wife letting him know that he passed away. “His presence will stay with me as I continue my path in medicine and is a reminder of the impact we have on patients. In all, my time at Emory was as career-affirming as it was humbling. Emory will always be a home to me,” he says. Alleyne matched at the University of Chicago for emergency medicine. Olivia Gorbatkin grew up in Decatur, Georgia, and graduated from the University of Georgia majoring in biology and is now looking for her next adventure. She considered pursuing a career in marine biology, but found herself drawn towards human health and pediatrics after spending two years teaching youth, volunteering with Camp Twin Lakes, and coaching soccer. “I felt especially lucky to be able to stay in Atlanta for medical school since I grew up in Decatur, my family lives here, and my sister is one of my medical school classmates,” Gorbatkin says. Olivia’s sister, Jenna Gorbatkin, is also a 2019 MD candidate at Emory, specializing in pediatrics. Their father, Steven M. Gorbatkin, MD, PhD, is an associate professor of renal medicine at the School of Medicine and chief of medicine at the Atlanta Veterans Affairs Medical Center. "Jenna and Olivia were seven and five years old when I started my medical training at Emory. It was wonderful to have them feel part of the journey. Two decades later, with them both here for medical school, it has been a thrill for my wife Laurie and me to stay closely connected to their adventure and see them thrive as part of the Emory family,” he says. Olivia Gorbatkin is also couples matching with her fiancé, Gabriel Perlow, who also graduates from the Emory School of Medicine this year. Participating in a National Residency Matching Program Match as a couple allows two applicants to link their rank order lists, usually for purposes of obtaining positions in the same geographic location. Olivia Gorbatkin and Gabriel Perlow both matched at the University of Washington for pediatrics. Jenna Gorbatkin matched at Emory for pediatrics. Joey Sharp grew up around the corner from Emory in Decatur, Georgia, graduating from Lakeside High School and the University of Georgia, but his medical education has taken him to Dharamsala, India, and the Himalayas for classes on Tibetan medicine and a month on the wards of the national referral hospital in Uganda. “Growing up in Atlanta I knew the vital role that Grady Memorial Hospital plays in the city and largely fell in love with Emory because of the opportunity to learn and care for patients at Grady. I also knew that the faculty was outstanding, there was a strong affiliation with Emory’s Rollins School of Public Health and CDC and I was excited about the 18-month pre-clinical curriculum,” Sharp says. Throughout the pre-clinical years of the medical school program Joey helped to organize two student-run clinics for homeless men in downtown Atlanta and was active in Emory’s wilderness medicine club, where he participated in and led whitewater-kayaking trips to the Southern Appalachians. Sharp&apos;s first choice was to match at Emory for internal medicine training because of the incredible clinical training in a variety of hospitals, the outstanding faculty and mentors, and the great residents. “Between Grady, Emory University Hospital, Emory University Hospital Midtown, and the Atlanta Veterans Affairs Medical Center, I know that I will feel comfortable practicing in any clinical environment after finishing residency,” he says. Sharp matched at Emory for internal medicine. Photos by Jack Kearse. Video by Damon Meharg. Please visit the Emory School of Medicine, Emory.edu and the Emory News Center.